The route. Note the tidal allowance. At 08.20am on 25th August 2003 Harry and I were sat in our kayaks at Porth Dafarch on Anglesey about to paddle to Ireland. 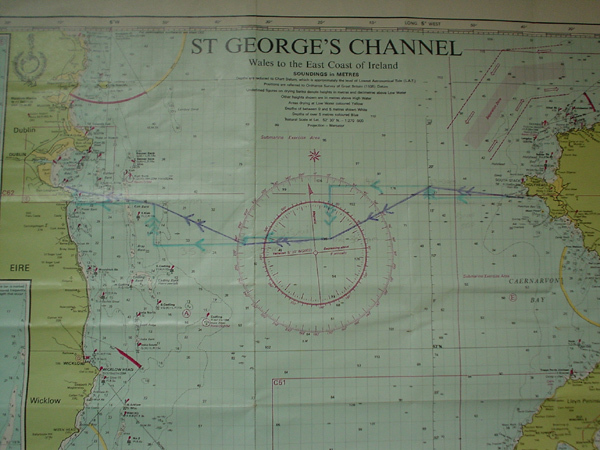 We reckoned that by leaving an hour before slack water that we’d drift north for an hour then south for roughly 6 hours, then north again for about 6 hours then towards the end of the journey start drifting southwards again. There was a F4-5 east northeast wind blowing and the sea was fairly flat, at least for now. We’d been to see Holyhead coastguard the day before to let them know what we were doing and they were fine but asked us to call them every few hours. We set off paddling out past Penrhyn Mawr and carried on west although the tide was still taking us north for a while until slack water. The plan was to always stay south of the Sea Cat that runs between Holyhead and Dun Laoghaire. For the first couple of hours the sea was fairly calm but the further we went the bigger it became. We stopped briefly after 3 hours to give the coastguard a call and have a quick toilet stop then off we went again. After another hour I had a bit of pain in my elbow so I switched paddles from my Nordkapp to an Archipelago which has a smaller blade and this seemed to do the trick. By now we had a following sea with 6 or 7 feet waves which kept breaking over the back of our kayaks. Stopping for a drink or to go to the toilet became increasingly difficult which meant that at times we didn’t stop when really we should have done to take in food and water. It was about 9 hours before we could see land ahead of us and it didn’t look any closer for quite a while. Pretty soon I began to feel rather ill but didn’t want to say anything as we still had a lot of paddling to do. I remember that for the next hour I was really struggling not to be sick while Harry looked like he was having a great time trying to go as fast as he could down the face of every breaking wave he could catch then suddenly I shouted out to him that I needed to raft up quick. As soon as he got to me I dropped on to his kayak and threw up all over his rear deck but the rough sea did a great job of washing it all away. We stayed rafted up for a couple of minutes and it was a bit of a worry that I wasn’t going to want to start paddling again but in no time I was feeling like new again (well for an hour or so anyway). As we started to lose daylight we knew that Kish Bank, a shallow area about 6 miles out from Dun Laoghaire, lay ahead of us. We thought that the sea might really kick up over it so wanted to be past it before dark. We were soon over it and it wasn’t any different to what we’d had for the rest of the journey. We paddled on a bit longer and suddenly Harry said there was a Sea Cat heading straight for us about 200 metres away which I hadn’t seen. We turned to try to get out of it’s way and saw a huge search light go on. It managed to pick us up and stayed on us as the Sea Cat went past. The wash from it combined with the waves coming in from behind us to make things quite difficult in the dark. I was completely drained by now but Harry kept pushing me to get to Ireland before the pubs shut. We kept out of the harbour and looked for somewhere to land. It all looked rocky and the waves were crashing in then we noticed a small beach facing north which was sheltered.It was just before 11.00pm when we landed, the 60 mile trip had taken us 14 hours 34 minutes. We were greeted by an incredibly friendly Irish lady who wanted to know everything about our journey. We climbed out of our wet clothes, got dried off and went to sleep on the grass verge at the side of the road. Next morning we strapped the kayaks on to trolleys and wheeled them a mile up the road to Dun Laoghaire ferry terminal where Stenna line were most helpful. They put the kayaks on for us and a couple of hours later we were back in Anglesey.The trip had been good but I still get stick off Harry for making him miss last orders.